Boghaunters are an early season dragonfly. What you have seen in the summer swarms is probably a combination of darners and emeralds. 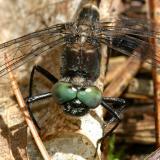 The emeralds having bright green eyes, and the darners are large, 3"-4". Of course I went right for the thumbnail labeled 'old green eyes'. I live close to where you take many of your woodland and conservation area shots. I don't know if what I've seen is a Ebony Boghaunter, but I will describe the sight a bit and perhaps you can reply. One summer in late afternoon, I looked out from the upstair's (30 ft. up)windows to see these enormous dragonflies zooming around the fir trees and over the raspberry beds and gravel driveway. It looked like someone put Fort Devens' helicopters on speed. It was hard to get a good look at one because they were swarming and zooming, turning sharply, then zooming back. The general coloration seemed green and black. Each dragonfly was (I'd guess) about 3-4 inches long -- or maybe they just seemed that big. I don't know what they were doing but I got the impression that they'd either recently hatched or emerged (whatever the drags do), or that some excellent food source had recently errupted. The next year (last year? ), there was another similar performance, although that time the coloration seemed a bit different. The area is embedded in woods, conservation area, State forest, ponds, brooks and standing water in isolated areas in a glacial gravel desposit. There is no shortage of insects and mosquitoes. Does your Ebony Boghaunter ever swarm or fly about the same area with tens of dozens of his pals? Your photos are eye candy for me. Thanks again.